ProForm has been in business since the 1980s and is owned by ICON Health & Fitness which is based in Utah and globally has more than 4,000 employees. ProForm is a well recognized brand (use to be called Pro-Form Fitness Products) for premium treadmills, exercise bikes, and ellipticals. ProForm has partnered with famous sporting events like The Boston Marathon and Le Tour De France and actually manufactures official treadmills and exercise bikes which are a recommended option for training for these prestigious events. Most of Pro-Form's treadmills, ellipticals and exercise bikes either support iFit or is iFit compatible. What is iFit? It is a smart fitness technology that gives you access to almost an infinite amount of training workouts. It adds custom built workouts with automatic tracking and routes which use Google Maps. Custom workouts can be downloaded by your favourite celebrity trainer and you can create your own routes by using Google Maps. When you do this your incline / decline and/or resistance of the fitness machine will automatically adjust based on the actual terrain from Google Maps. Plus you can enjoy street view images right on your machine console (if supported) and your tablet or phone. With iFit enabled machines all of your fitness information is automatically tracked on your iFit profile allowing you to see the results and compete with your friends. 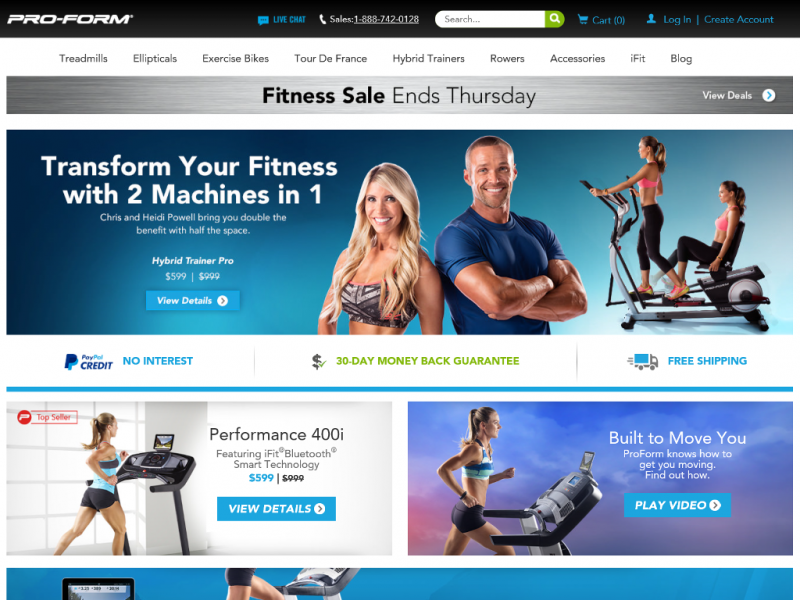 For the full featured iFit experience a subscription costs $99 per year. Some fitness machines may not support iFit out of the box and may require an additional module that can be purchased separately. ProForm Treadmills are a popular choice among runners who like to have a treadmill at home. Many of their treadmills fold to save space and all include high quality motors that are meant to last a lifetime. All Pro-Form treadmills include many pre-programmed workouts with their cheapest model having 16 programs. The Pro models of treadmills are one of the more popular series of treadmills. With them you can expect high-end motors (great for long periods of use) and construction with excellent cushioned treads, steep inclines of 15% (plus declines), and long warranties. The ProForm Pro 2000 Treadmill has a beefy 3.5 CHP Mach Z Commercial Pro Motor which will allow the treadmill on 2.5" non-flex rollers to reach 12 mph on a 60" length x 22" width commercial tread belt (great for long strides). The incline range is 0 to 15% and the decline is 0 to -3% of the deck. When storing the deck can be folded up freeing almost 50% of the floor space the treadmill takes up. You get a 7" backlit display which includes Pro-Form RaceTrack display. The treadmill also supports iFit and comes with a EKG heart rate monitor and cooling fan. The current price for this unit is $1,299.99 which includes free shipping. For more information read our Pro 2000 Treadmill review. The ProForm Pro 5000 Treadmill is new for 2016. It has all the features of the Pro 2000 but includes a heavier motor which means it keeps cooler during prolong use. It also comes with a 7" full-color touchscreen LCD display and more workout programs than the Pro 2000 at 38. Plus instead of 1 fan, the Pro 5000 comes with 2. The current price for the Pro 5000 Treadmill is $1,499.99 with shipping. The ProForm Pro 9000 Treadmill has all the features of the Pro 5000 but includes a heavier 4.25 CHP Mach Z Commercial Plus Motor. It also comes with a 10" color touch screen that is web enabled. Using the built-in WiFi of the 9000 you have access to the internet. The current price for the Pro 9000 Treadmill is $2,999 with shipping. The Premier treadmills includes the latest smart technology like iFit and include a web enabled color touch screen. These treadmills with their motors are ideal for your above average runner. The ProForm Premier 900 Treadmill can go up to 12 mph and a quick incline of 12% (no decline). It console sports a web enabled 7" color touchscreen and 30 workout apps. It is compatible with iFit and your iPod, and it comes with an adjustable tablet holder. The foldable tread belt is 55" long by 22" wide and has ProShox cushioning to reduce impact while running. You can also keep yourself cool with the built-in workout fan and keep track of your heart rate with the built in grip sensors or with a Bluetooth compatible heart rate monitor. The Premier 900 Treadmill is currently going for $899 which includes shipping. The ProForm Premier 1300 Treadmill does everything that the Premier 900 can but it does have a few improvements. It has a beefier motor for intense workouts and a longer tread platform at 60" long by 20" wide which is ideal for runners with long strides. It also has a greater weight capacity than the 900 at 350lbs. On the console side the full-color display has a 10" diameter and includes 34 workout apps. The price for this model is $2,499. You can expect fast-paced workouts with these more affordable treadmills. These machines are ideal for walking and running but come with simpler consoles than the higher end ProForm treadmills and smaller motors and less incline options. Still, the Sport Series includes many features you would only expect in high end models from Pro-Form competitors. The ProForm Sport 5.0 Treadmill is an entry level model. The console includes the Round Watts LED display which contains a lot of information and is compatible with iFit via Bluetooth and has a a music port with 2 speakers. You also have 20 pre-programmed workouts for a variety of options. Your heart rate can also be calculated by using the dual-grip EKG heart rate monitor. The Tread belt is 55" long and is cushioned with shocks and has a top speed of 10 mph. With a touch of a button you can change the Sport 5.0 incline from 0 to 10%. The ProForm Sport 5.0 Treadmill retails for $599 with shipping. Designed in part by the Boston Athletic Association coaching staff the Boston Series was designed with the marathon runner in mind. From the first day of your training to race day this treadmill has a 16 week and 20 week programs designed for you to succeed in the actual Boston Marathon whether you are a beginner, intermediate or at an advance level of training. The ProForm Boston Marathon 3.0 Treadmill is an extreme treadmill that breaks all barriers. It comes with a 4.25 CHP Commercial Pro Motor which has a top speed of 15 mph which means if you are able you can run a 4 minute mile on this machine. It also comes with a 0 to 20% incline range and a 0 to 6% decline range which is motorized and instantly adjustable. The console includes a 10" high-def color touch screen which is preloaded with high definition video of the actual Boston Marathon course. It also comes iFit enabled which means you can run any other real-life course of your choosing. The Boston Marathon 3.0 also includes ProForm's longest deck at 62" and a non-stretch, 2-ply, commercial tread belt. The Boston Marathon 3.0 Treadmill costs $2,499 which also includes shipping. The ProForm Boston Marathon 4.0 Treadmill is an update of the 3.0 and includes a few enhancements. With this treadmill you get Runner Flex impact control which is a full length suspension for the treadmill which is designed to cushion your joints and reduce impact. This feature can be turned off to simulate road conditions. Using Bluetooth technology the included speed ring slips on your finger and allows you to control wireless how fast you want to go without breaking your stride. Along with the included Adidas ANT+ Wireless Chest Strap that sends your heart rate right to your treadmill screen you have all the runner tech that you need. Including free shipping the Boston Marathon 4.0 Treadmill costs $2,999. ProForm have several series of models of elliptical trainers. The Front and Rear Drive Series refer to the location of the flywheel. Typically the front drive designs have a bigger flywheel, longer strides, and other advanced features. With more features comes a higher cost. The third series of ellipticals is the hybrid trainers. These are a combination of the best features of a elliptical and a recumbent exercise bike in one. The ProForm Endurance 920 E Elliptical is new for 2016 and features an updated front drive design. It has a 20" adjustable stride and a 25 lb effective flywheel. The over-sized pedals are also adjustable. Available inclines is anywhere from 0 to 20° and the 920 has 24 digital resistance levels. The Endurance 920 E sports a larger 7" full color touchscreen with 32 workout apps and it is iFit enabled. As with older models it has an integrated tablet holder, iPod compatible audio, USB charging, heart rate monitor, and a CoolAire workout fan. The Endurance 920 E is priced for sale at $999.00 plus free shipping. For more information read our Endurance 920 E Elliptical review. The ProForm Pro 16.9 Elliptical is another new model for 2016. This front drive elliptical has a 20" stride with 26 silent magnetic resistance levels and also offers up to 20° inclines. It comes with a 32 lb effective flywheel so at higher resistance levels you can really feel the burn. The Pro 16.9 elliptical console is iFit ready and has a 10" color touchscreen. It has 35 pre-programmed workouts and supports audio devices. This fitness machine also comes with a tablet and water bottle holder and heart rate sensor grips and a wireless heart rate chest strap. The Pro 16.9 Elliptical costs with free shipping $1,499. For more information read our Pro 16.9 Elliptical review. The ProForm Hybrid Trainer Pro is a two in one fitness machine. It is an elliptical and a recumbent bike all in one. With this rear drive model you have a 17" elliptical stride and 20 resistance levels from a inertia enhanced flywheel. It comes with EKG Grip Pulse which measures your heart rate and a LCD console with a tablet holder. The LCD displays your speed, time, distance and calories burned. It also supports iFit via Bluetooth. The console has built in speakers that you can plug in your iPod or MP3 player. For biking the cushioned seat is adjustable for a comfortable ride. The Hybrid Trainer Pro currently retails with free shipping for $599. There are 2 types of exercise bikes that Pro-Form manufactures. There are recumbent bikes which allows you to sit on a seat with a backrest (like a chair) with the pedals placed forward, and there are upright bikes which is very similar to a traditional bike with grips, the bike seat, and pedals all located in familiar locations. The ProForm TDF 1.0 Bike (TDF stands for Tour De France) is an upright bike designed to mimic the conditions of the Tour De France and other popular bike races. With up to 15% incline and decline, and a inertia enhanced flywheel with a freewheel clutch, the circular motion of pedalling is smooth, just like an outdoor bike. The TDF 1.0 also features 26 customizable gear ratios that you can change to match your own bike. Along with an adjustable seat you have controls built into the handle bars which makes it easy to change the incline and gears at a moments notice. The console has a Round Watts LED display which shows you your power output, tempo, peak zones, and other important information. Along with iFit support you also get 24 preset tour apps that are designed to test your endurance from mountainous terrain to long flat roadways. The console also includes iPod and MP3 support with dual speakers and a integrated tablet holder. With your tablet and the iFit app it can talk with the TDF 1.0 through Bluetooth. With this feature it means you can draw any course using Google Maps Routes and ride it on your exercise bike. The Tour de France 1.0 training bike costs $999 and includes free shipping. The ProForm TDF 5.0 Bike is the official premier training bike in the Tour De France series. It contains all the features of the TDF 1.0 plus a number of upgrades. First of all this bike allows for -20% to 20% inclines and has 30 customizable digital gears. It also comes with a 10" high def color touchscreen in the console which allows you to browse the web and use the fitness apps you want (Android OS). iFit is built in which allows you to use Google Maps and design your own route that uses all the inclines and declines found in the real world. The console is also compatible with hands-free BLE heart rate monitors. Everything is adjustable on this bike, from the feet which you can level individually in case you have the indoor cycle on an uneven surface, to the adjustable saddle and handlebars. The pedals also come with toe cages and straps, and 2 water bottle holders. The Tour De France 5.0 exercise bike currently is priced at $1,999 with free shipping. The ProForm 440 ES Bike is a recumbent bike. The seat can hold up to 350 lbs and can be adjusted vertically and horizontally. It includes a cushioned seat with a lumbar supported back rest. The 18 lb effective flywheel has smooth resistance (25 levels) and is very quiet thanks to silent magnetic resistance. The console has 32 workout programs built in and includes a 5" backlit display that makes it easy to read what your current stats are. The console also supports iFit through Bluetooth and comes with an integrated tablet holder to make viewing the iFit information much easier. There is a cool down fan with 2 speeds and a USB port with speakers so you can plugin your favorite music player. Finally, the right upper hand grip includes a EKG heart rate monitor. The ProForm 440 ES recumbent bike costs $599 with free shipping. All ProForm products come with a 30-day money back guarantee. If for any reason you are not happy with your purchase you can return it by calling customer service. Shipping charges are not refundable and you must pay for the return delivery. A 10% restocking fee will also be charged on non-defective products. Most of Pro-Form fitness machines come with a lifetime frame warranty. Depending on the machine, motor warranties range from 25 years to life time. Parts warranties range from 3 to 6 years for most machines and labor ranges from 1 to 3 years. Any lifetime warranty pertains to the lifetime of the original purchaser. If you register your product within 30 days from purchase, ProForm will extend your original warranty by a full 90 days. 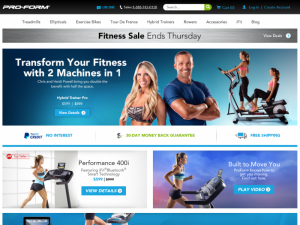 Almost all treadmills, ellipticals, exercise bikes and rowers include free shipping if you pay for your purchase with your credit card. Pro-Form uses a number of shipping companies (like Fedex Frieght, MXG Group, etc.). All shipments are curbside deliveries and require the signature of the customer. Pro-Form customer service can be contacted via email, online form, online chat and via a toll free phone number. On their support site you can find digital copies of all manuals as well as the ability to register your fitness machine. ProForm's YouTube channel contains assembly and how to videos for most of their machines. You can also interact with Pro-Form and other customers via their Social Media pages (Facebook, Twitter, Google+, etc.). An official Pro-Form blog is also accessible from the main website which has articles from experts on training, recipes and other fitness related news.